Learn how to move and copy items to keep them organized or share them with family or team members. If you have multiple vaults, you can move and copy items between them to organize your data or share with others who have access to those vaults. Learn how to create and share vaults. Open a vault and select an item. To move items, drag them to a vault. Or choose Item > Move to Vault > [vault name]. 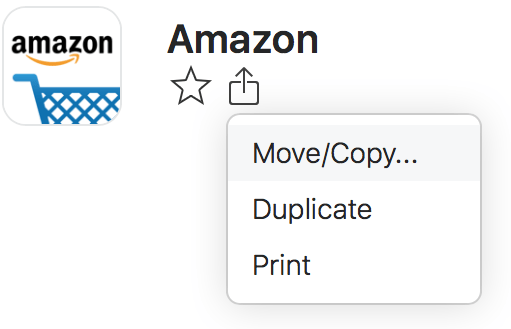 To copy items, hold the Option key while dragging. Or choose Item > Copy to Vault > [vault name]. To move or copy items to a new vault, drag them to New Vault. If you don’t see your vaults in the sidebar, click All Vaults at the top of the sidebar or choose View > Show/Hide Vaults (Command-L). If you have a different vault selected, you’ll see its name instead of All Vaults. To move or copy an item, tap it. You’ll see the item’s details. Scroll down and tap Move and Copy. In any item list, scroll to the top and tap Select Items. Select the items. You can select all the items in the list using the checkbox above the list. Tap Move or Copy and choose a vault. Select an item. To select multiple items, hold the Ctrl key while selecting them. To select all the items in a list, press Ctrl + A. Choose Item > Share > [vault name] > Copy or Move. To move or copy an item, tap it. You’ll see the item’s details. Tap , then tap Move or Copy and choose a vault. 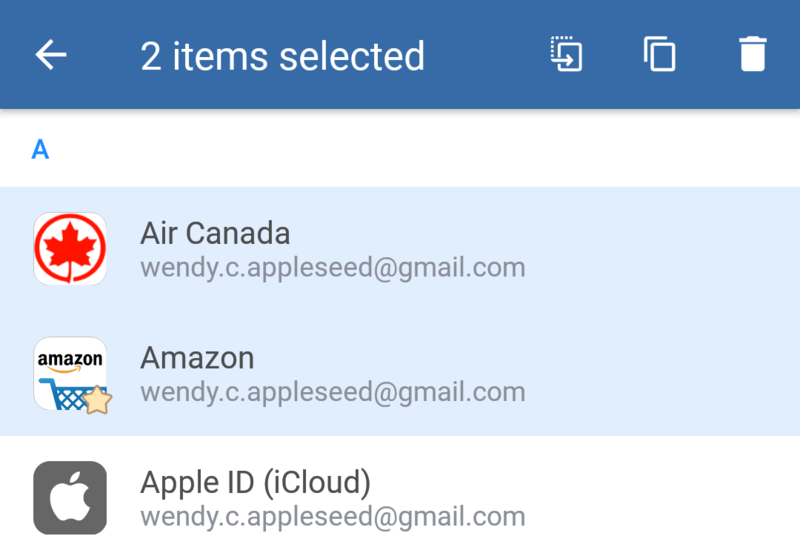 In any item list, touch and hold an item, then tap the other items you want to select. 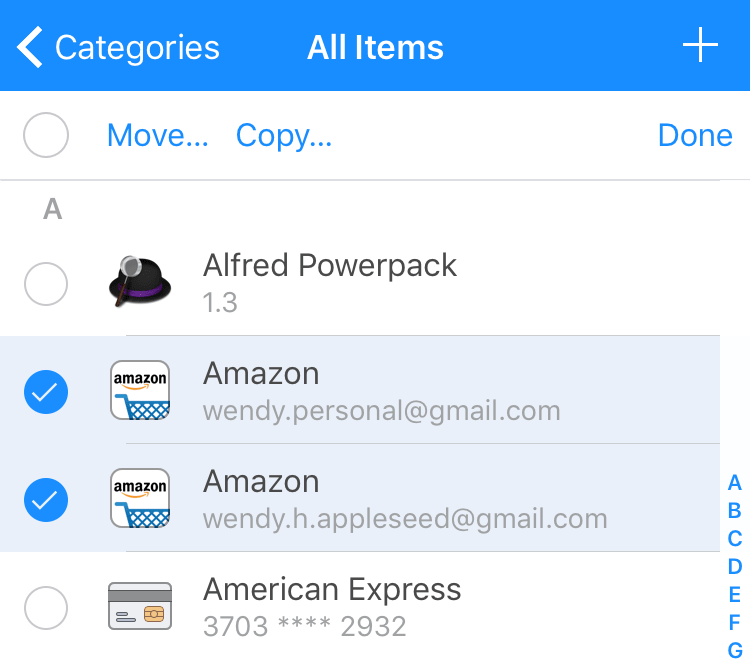 To select all the items in a list, tap > Select All. To move the items, tap . To copy the items, tap . Then choose a vault. If you don’t see , first tap . If you can’t move items to a shared vault, ask your family organizer or team administrator if you have the right permissions.